Despite what my mother taught me as a child...I love playing with my food. Coming up with a new recipe always thrills me. Excitedly I wait as my husband takes the first bite, eager to know the fate of my creativity. This one was a winner! My week is a success!! I hope you like it as well. 1. Combine Cajun spice, brown sugar, lime zest and salt in a small bowl. 2. Rub over all surfaces of the chicken. 3. 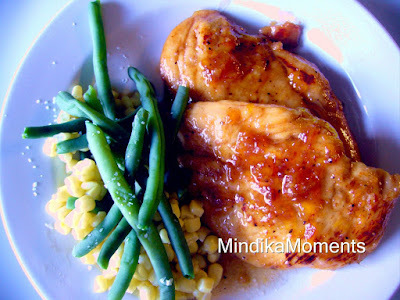 Sauté chicken breasts in oil in a large nonstick skillet over medium-high heat for 3-4 minutes. Turn and sauté an additional 2-4 minutes. 4. Blend marmalade and lime juice; swirl in pan until melted. 5. Reduce heat and cover for 5 minutes or until chicken is cooked through. It shouldn't’t take too long if the chicken has been pounded flat. That looks so divine! I have to say I agree with you on the disappointment of eating out. It's all bad these days. So here's to you and your recipes!